It seems like everything I have doing in the garden lately has been haphazard: a little bit here, a little bit there. I know that ultimately things will come together, but right now it feels like a jigsaw puzzle whose pieces are scattered all over. The same holds true for recent plant purchases. Nothing focused, just whatever catches my eye, happens to come to my attention, or simply lands in my lap. This post is about three genera beginning with the letter a that been front and center in the last month. 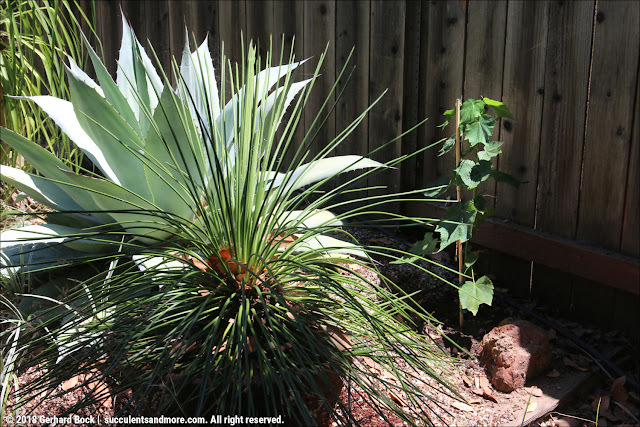 Two are not surprising—agaves and aloes—but the third one is: abutilons, or flowering maples. Read on to find out more. 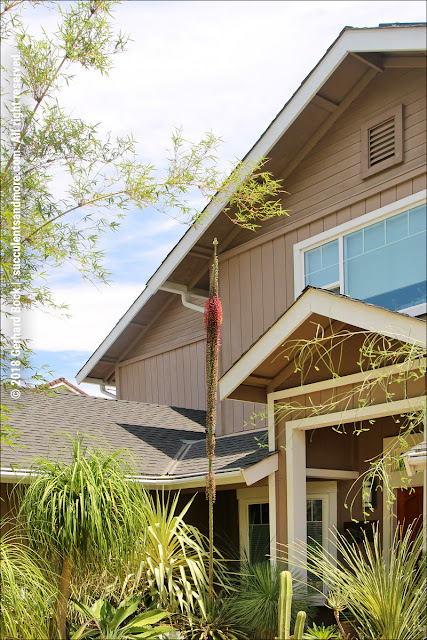 Starting with agaves: It's impossible to miss the flowering Agave schidigera near the front door. The flowers on the stalk have been opening up bottom to top for the last five weeks or so. Check out this post to see earlier photos. The flowers are a reddish maroon—a striking color. In another week or so the flowering will be over. I haven't decided yet if I will cut down the flower stalk and dig out the mother plant, which is dying, or if I will wait to see if there will be any seeds. There is so much nectar in the flowers that a sticky patch has formed on the flagstone and there's an ant superhighway going up and down the flower stalk. 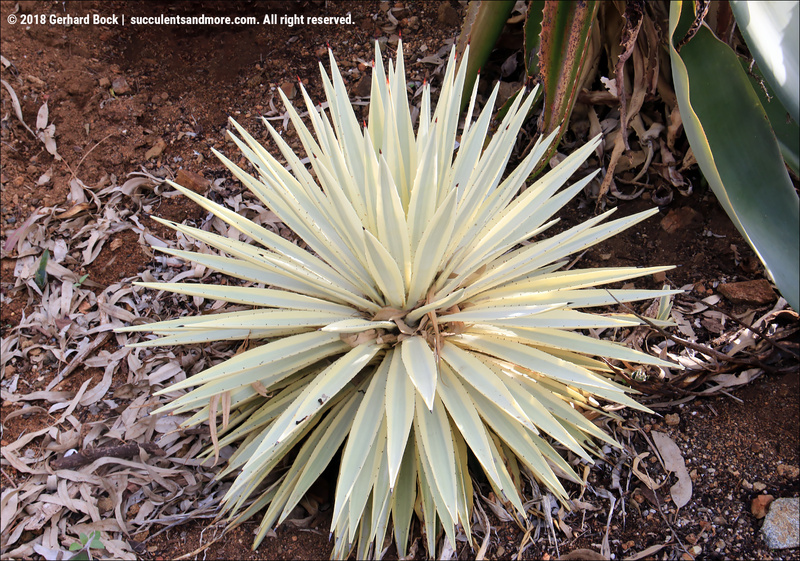 ...Agave bracteosa 'Stingray', essentially the same variegation as 'Monterrey Frost' but with creamy margins instead of white. All of these are small and will be in pots until they're large enough to go in the ground. 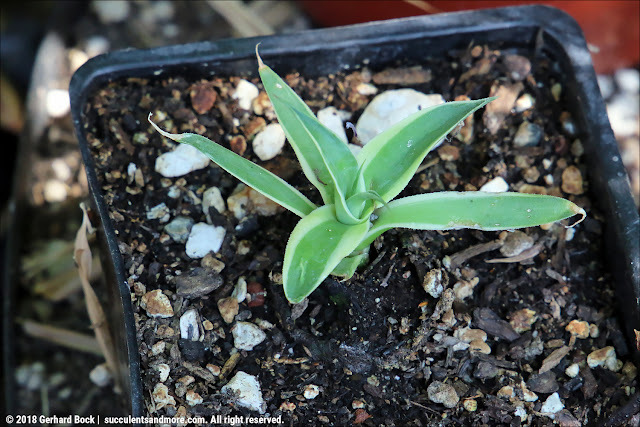 The two agaves in the next photo are pups that hitched a ride home with us from our recent Orange County college tour: Agave shawii (top) and Agave attenuata (middle). 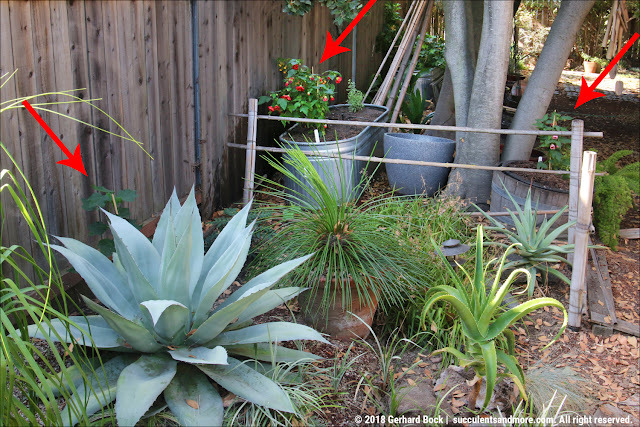 There are six agaves in the next photo, but only two are new: the two in the middle of the front row. 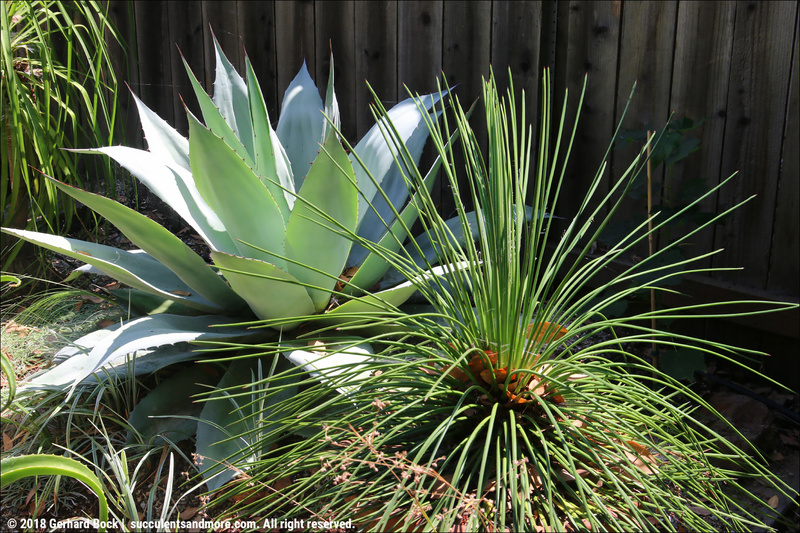 They're a rare sport of Agave angustifolia with predominantly white or creamy leaves. Some leaves have very little green. I've seen this form referred to as 'Woodrowii' or 'Milky Way'. I saw stunning specimens at the Huntington and at Rancho Soledad Nursery in San Diego County. The agave in the next photo has found what might be its permanent home. It's a Plant Delights hybrid called 'Bluebells Giants'. 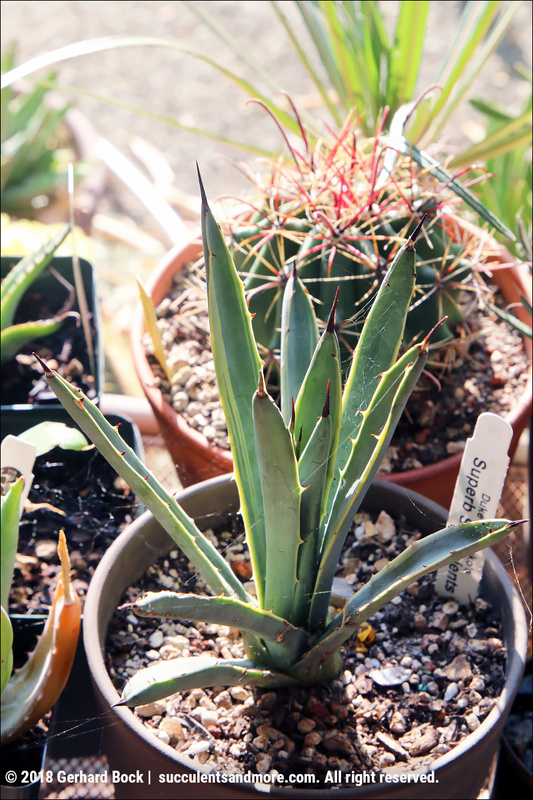 The parents are Agave × protoamericana and Agave × pseudoferox 'Bellville'. Plant Delights expects this hybrid to reach at least 7 ft. in height and 12 (!) ft. in width. Needless to say I don't have a spot in our garden for an agave that massive, but I really wanted to get one to see how large it would grow in a big pot. We shall see. 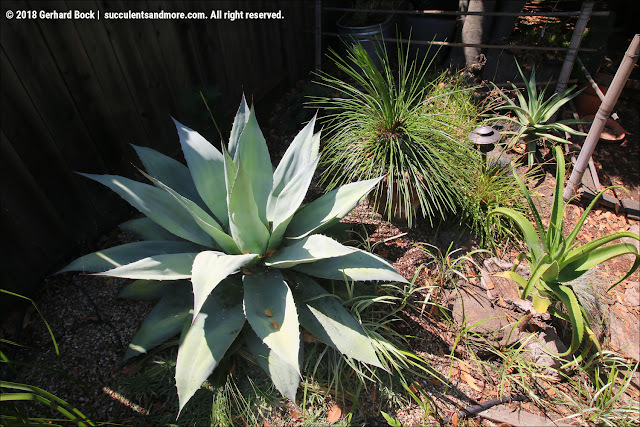 The two agaves in the next photo aren't new but they don't make it onto this pages of this blog very often. I do think they look great next to each other. 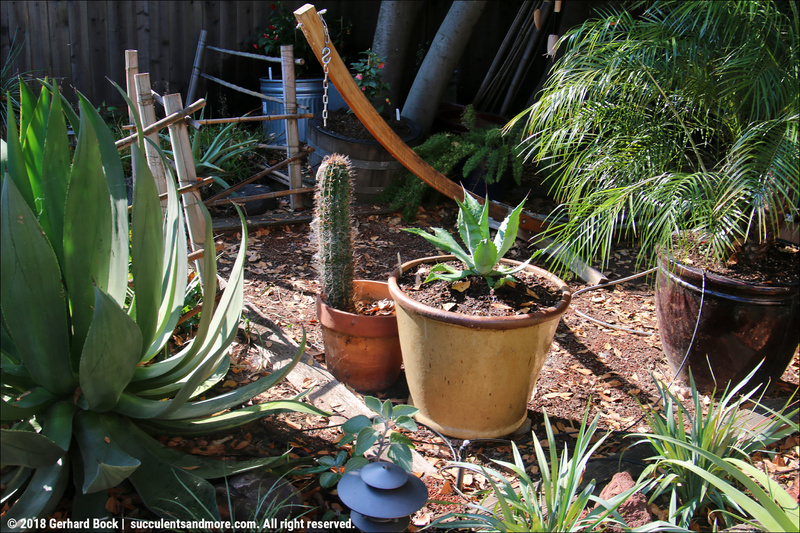 Agave ovatifolia 'Vanzie' and Agave geminiflora in the backyard. 'Vanzie' is the ground, geminiflora is in a pot. They're not the same size at all, it just looks like it because of the perspective. Aloe ortholopha is a winter bloomer so this seemed strange. 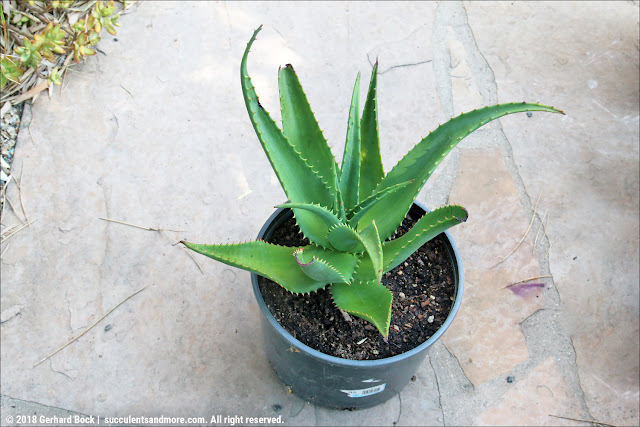 In actuality, it was yet another clue that this isn't Aloe ortholopha at all. The leaf color, the teeth, they just didn't fit the photos online and the specimens I saw at the UC Davis Botanical Conservatory (click here to see them). As the flower stalk got taller and it became clear that the flowers would be yellow (A. ortholopha has red flowers on fairly horizontal inflorescences), I began to suspect this might be Aloe africana. 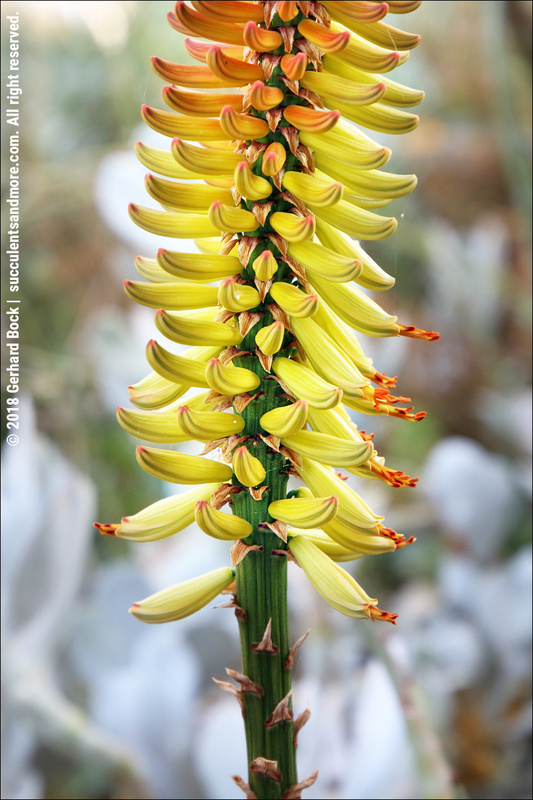 While Aloe africana typically flowers in the winter or early spring, it is known to bloom at other times of year as well. The final confirmation is the shape of the open flowers: They're downturned but make an upward swoop at the tip, a bit like a ski jump. 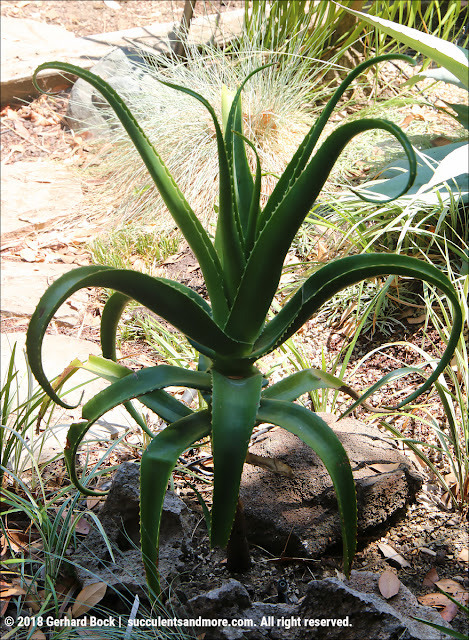 This is a characteristic unique to Aloe africana. 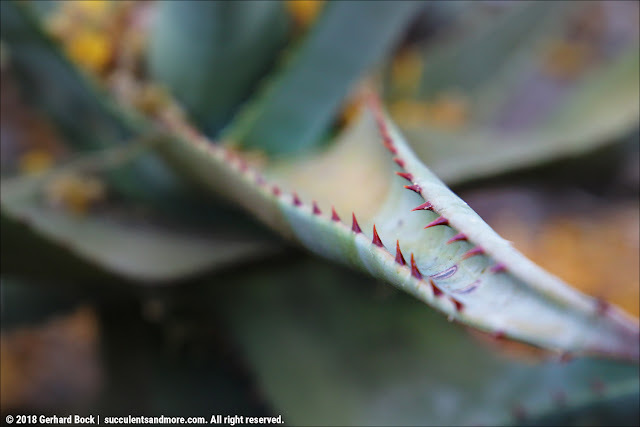 Another Aloe africana signature element are the prominent red teeth along the leaf margins. 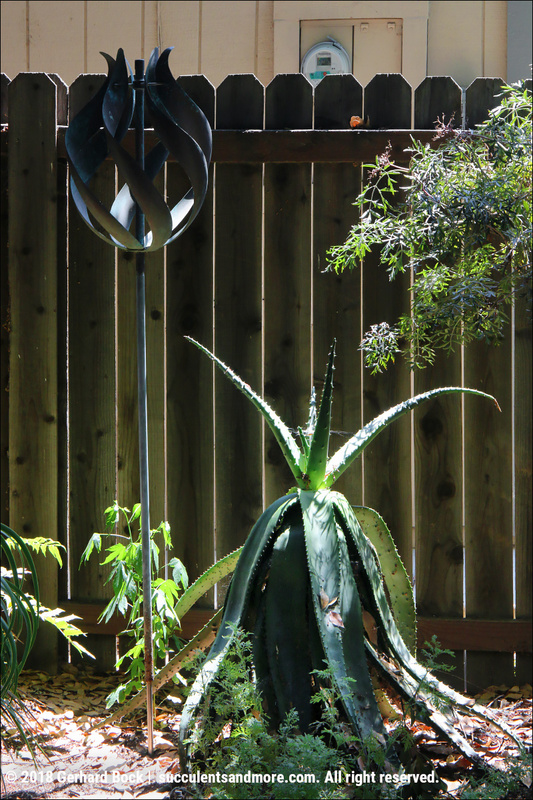 They're quite sharp compared to most aloe species. Here is a real Aloe ortholopha. 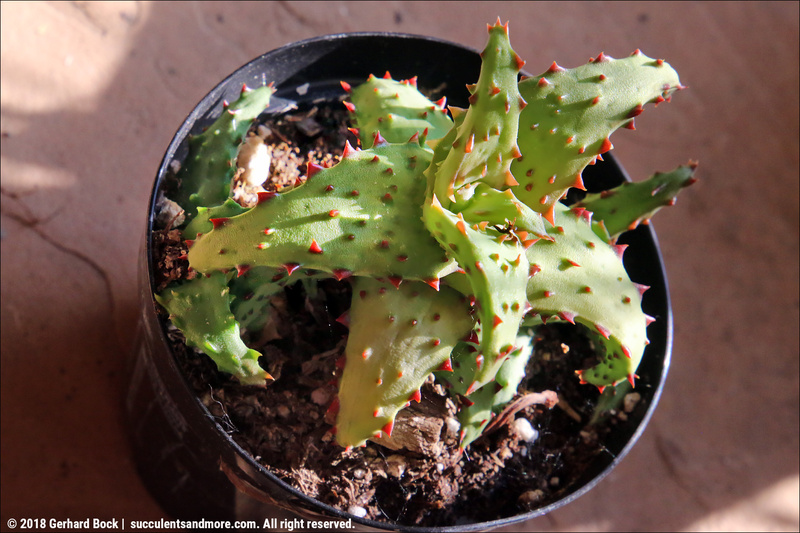 I got it recently from Arid Lands in Tucson, AZ. It's small but it looks right. Another Arid Lands purchase is Aloe 'Goliath' below, a hybrid between Aloe vaombe and Aloidendron barberae. 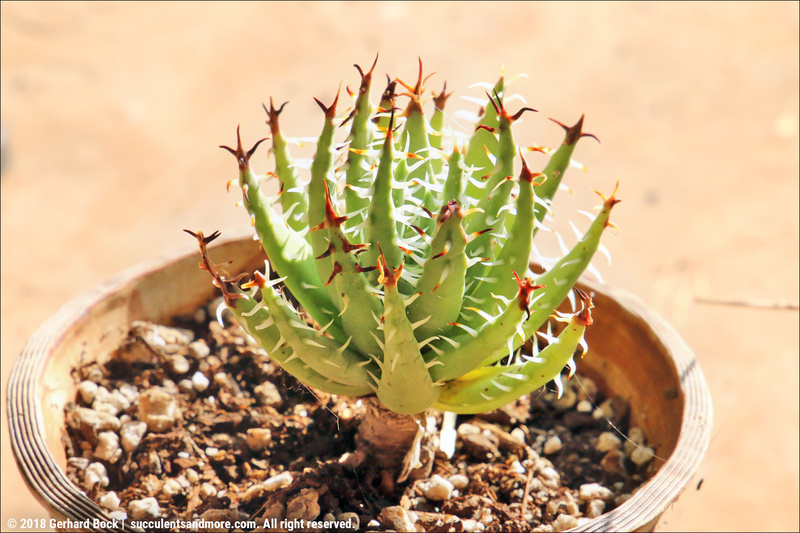 Actually, what Arid Lands is selling are seedlings resulting from the cross-pollination of two Aloe 'Goliath'. I don't know what this means in terms of long-term appearance or growth habit, but right now the leaves have a vaombe look to them. 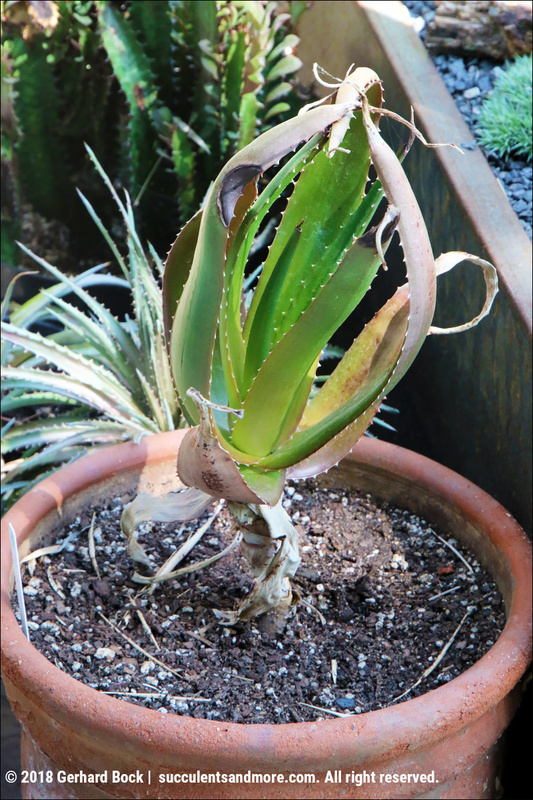 It will be a massive tree aloe someday, but for now it'll live in a pot. Most likely I'll plant it near the front door where it will be sheltered in the winter. No doubt, Agave ovatifolia 'Vanzie' and Agave geminiflora look awesome in the photo below, but I want you to focus on the two aloes on the right side. 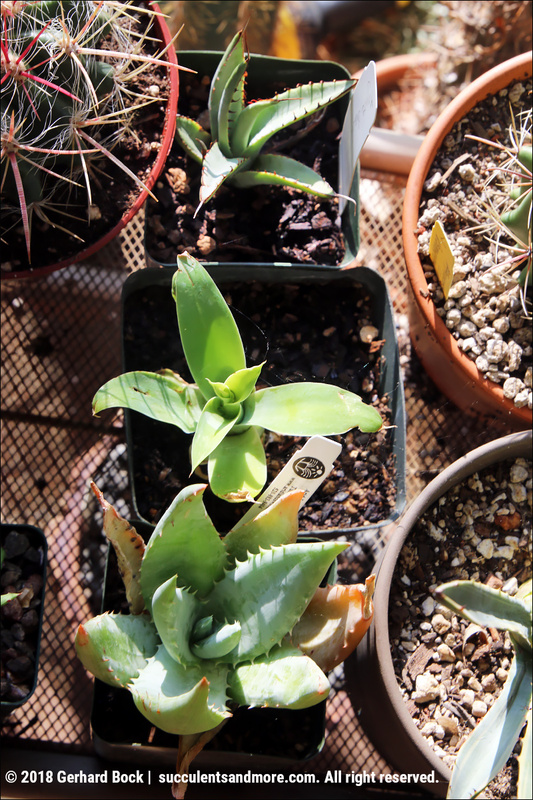 The one in the back is a hybrid I received as a gift; I don't really know what its parentage is but it looks like there might be some Aloe ferox in it. The other one is Aloe helenae, a tree aloe from Madagascar with a mature height of 8-12 ft. Not a lot is known about its cold tolerance; even 28°F might be pushing it—or it might surprise people and be hardier than that. 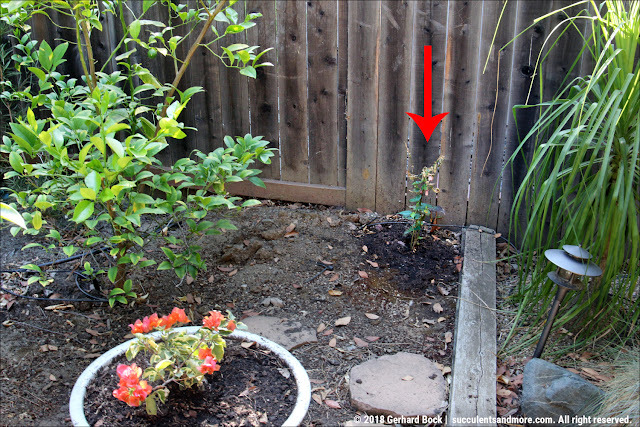 The spot where I planted it in the backyard is fairly well protected so it should be OK. 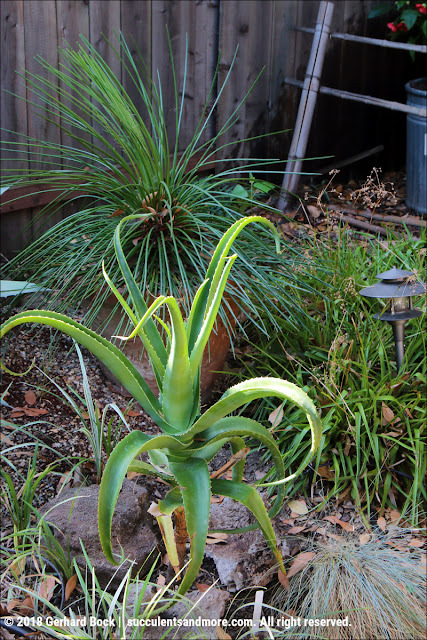 The last aloe I want to show you has been in the ground for a long while—maybe 7 or 8. It's just a regular Aloe marlothii, but it doesn't get a lot of direct sun so its leaves are elongated and floppy. Other than that, it seems happy and healthy. Next to the Aloe marlothii above is the first abutilon I planted this year. It's a hybrid called 'Tiger Eye'. Check out the spectacular flowers! 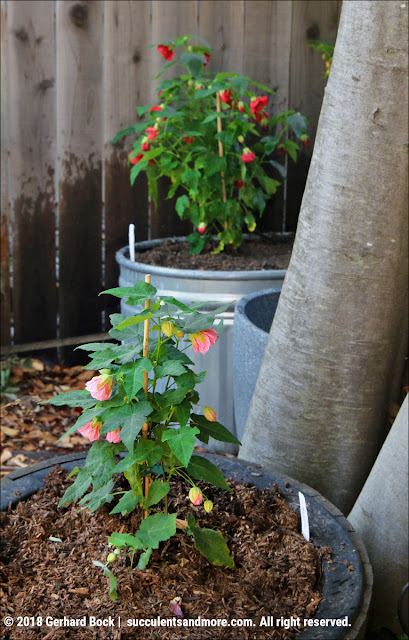 Abutilons, commonly called flowering maples because of their leaves although they're not related to real maples, are among the few plants that have done well in the shadier spots in the backyard. 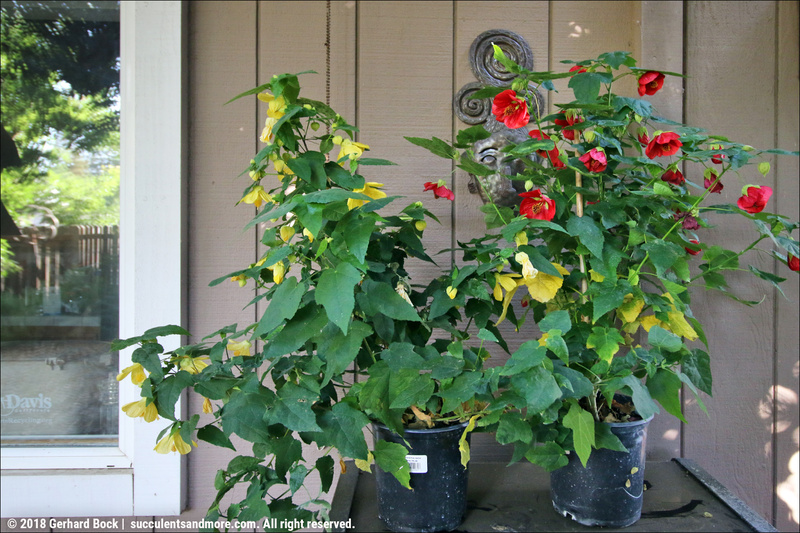 We had an Abutilon 'Souvenir de Bonn' and an Abutilon pictum 'Thompsonii' for a number of years. After they got established, they didn't receive any more water than anything else. The problem was these two cultivars tend to get particularly lanky, and I never trimmed them aggressively enough. This time around I'm more educated and more willing to nip and tuck as needed. Next are two cultivars from the Lucky Lantern series. They're genetic dwarfs developed in Australia and are supposed to only grow to 12×12 inches. Except they were at least 18 inches when I bought them (they're in #1 cans in the photo below). Still, if they top out at 2 ft., I'd be happy enough. Below is 'Lucky Lantern Red' in the stock tank that once held running bamboos. The one next to it is 'Paisley', a clambering hybrid that will soon have a series of wires on the fence to climb up. In the next photo, 'Lucky Lantern Red' is in the back, and a bushier cultivar called 'Watermelon Candy' in the front. It's in a half wine barrel that once held a Chinese walking stick bamboo. 'Watermelon Candy' is a Monterey Bay Nursery introduction with a mature height of 4-6 ft.—perfect for this spot next to California bay tree #4. 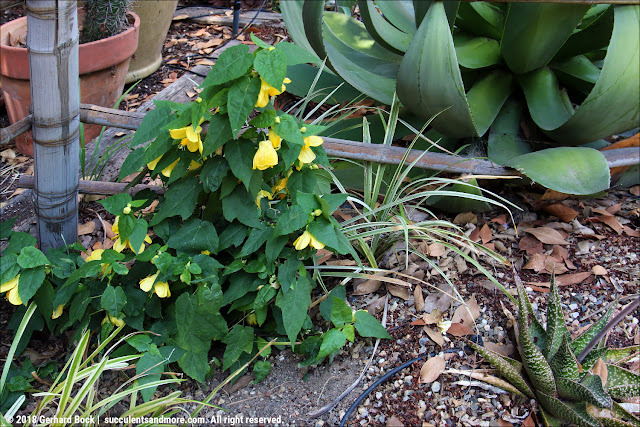 Next to Agave ovatifolia 'Vanzie' is one of two Abutilon 'Victor Reiter'. It's quite possibly my favorite abutilon cultivar—look at these flowers! 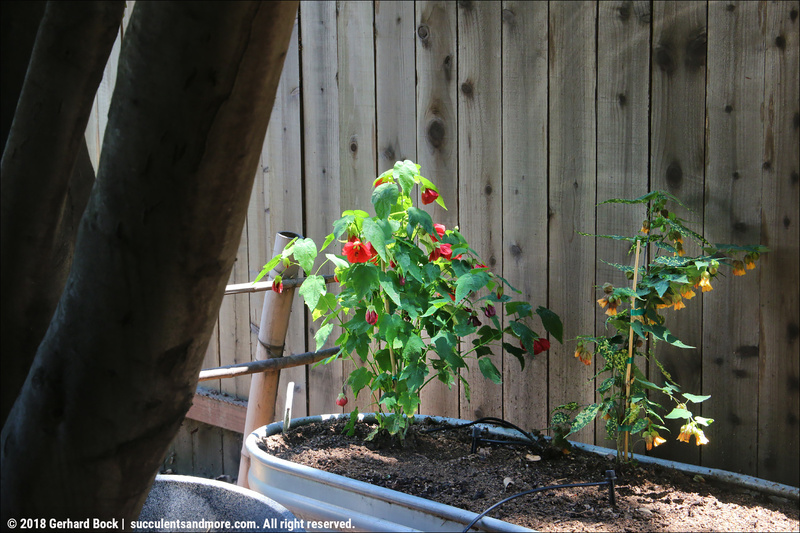 There's one final abutilon in this area of the backyard. I brought it back from Mendocino at the end of June, but it almost died when I forgot to water it for a few days before planting. Fortunately, it pulled through and has pushed new leaves. It's another Monterey Bay Nursery introduction called 'Orange Hot Lava'. 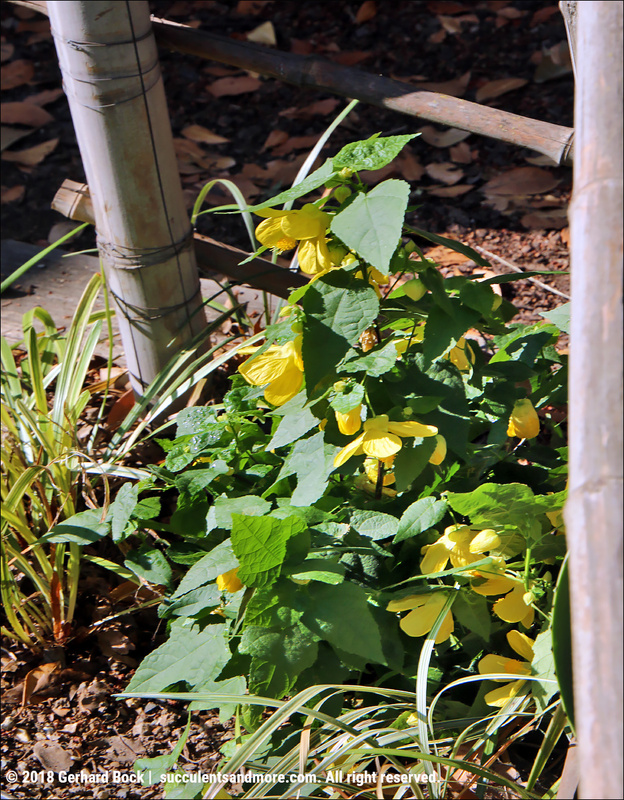 Like 'Paisley' it has Abutilon megapotamicum in its lineage which means it has a semi-vining habit and prefers to have something to scramble up on. More guide wires to be installed on the fence! We're almost at the end of this post. Just one more to show you, in the opposite corner of the backyard. It's another Abutilon 'Victor Reiter', smaller than the other one, but growing well. While these abutilons are getting established, they will need regular water. 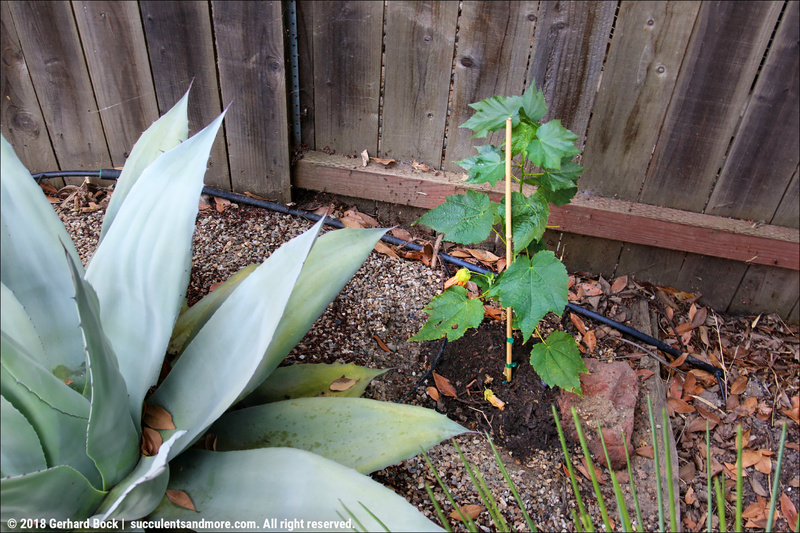 We've been irrigating various potted plants in the backyard using gray water from the kitchen sink; some of it will now go to the abutilons. After writing this post, I'm surprised myself how completely I've embraced abutilons to solve our nothing-attractive-will-grow-in-the-shade problem. I guess I rarely do things half-heartedly! Great collection of agaves and aloes. So jealous that you can find variegated agaves more easily than we can in the UK. 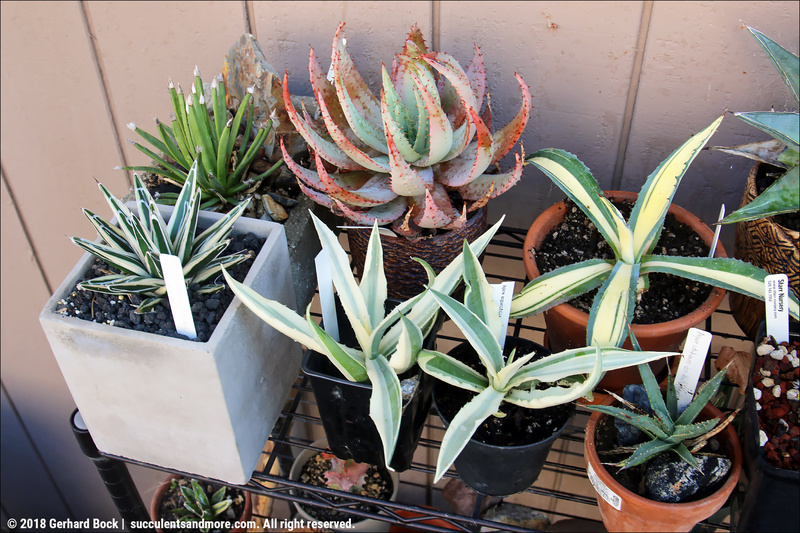 Some of the newer variegated agaves have originated in Holland. You should be able to find those more easily. My buying habits are a lot like that too, although your eye for and ability to source unusual specimens is far greater than mine. The Abutilons surprised me! I've killed a few of these plants over the years but currently have one, 'Talini's Pink', in a large pot in my lath house. So far, so good, but it'll have to move someday as it's already getting big. Is that silver plant in the last photo Senecio candicans? Kris, so much of it is luck. Plus, when I see something interesting, I buy it right away now. In the old days, I would wasted time mulling it over, and by then it might have been gone. Good to hear you're having good luck with Lucky Lantern as well. I do wonder where all of these new plants will go... even potted, you seem to have an abundance of pots already. You must be near capacity? It looks like a lot of new plants (and it is) but many are still small and don't take up any room. It'll be a lot more challenging finding forever homes when they're bigger. Cool Agaves. I find PD's use of combined species names for hybrids somewhat annoying, though. He seems to like to create controversy, which there is too much of these days. Abutilon 'Victor Reiter', I'm impressed with also. My castilloniae has a flower stem--it's one inch tall! Controversy: Yep, some people thrive on it. I try to keep track, very superficially, of discussions in various succulent forums, and man, there's a lot of arguing. I have no interest in getting sucked in. 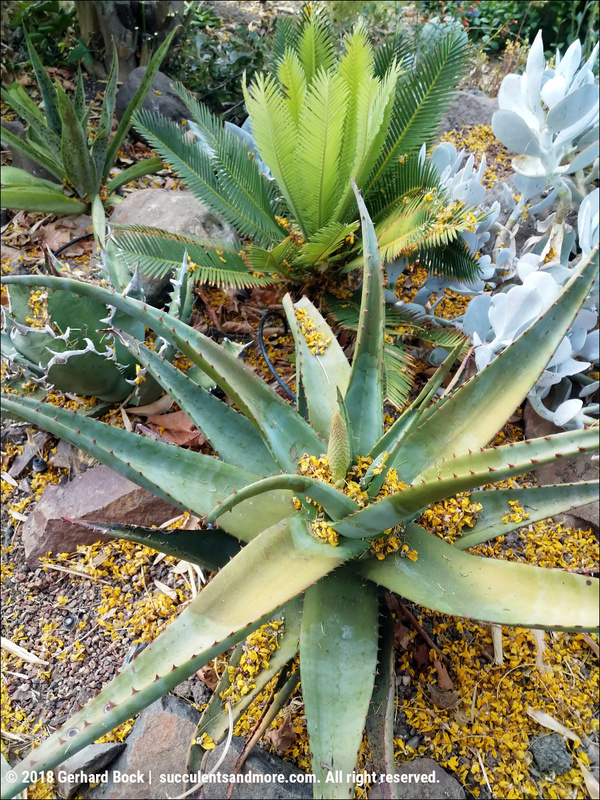 It seems that Aloe castilloniae flowers young. 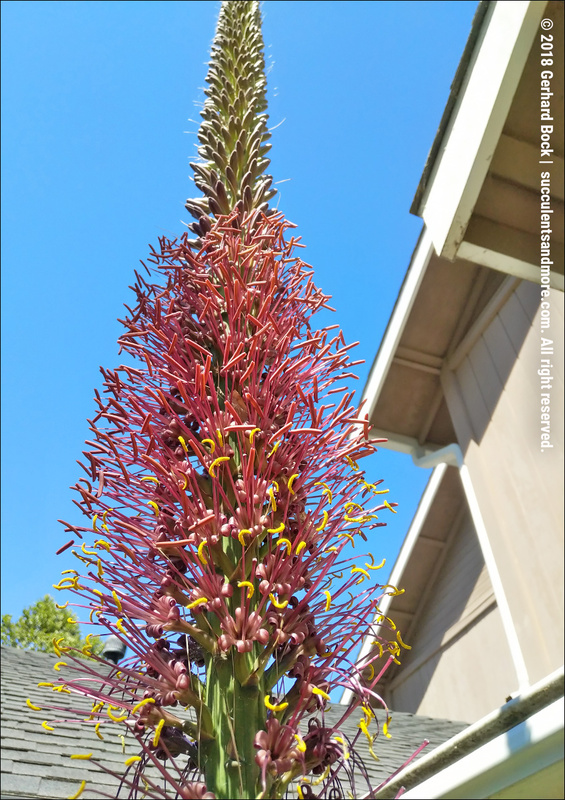 Or maybe flowering-size plants aren't young even though they're small. It's a cool plant that forms alien-looking mounds from what I've seen. Yours is in a pot, too, I assume? yes, too small to go into the ground just yet, and a choice spot seems mandatory. Well I have to say that I have found myself to be far more deliberate in my plant purchases this year-which is a complete reversal of MO on my part. And as a result there are parts of my garden that look semi-cohesive. Not that I have not made numerous impulse purchases as well ! 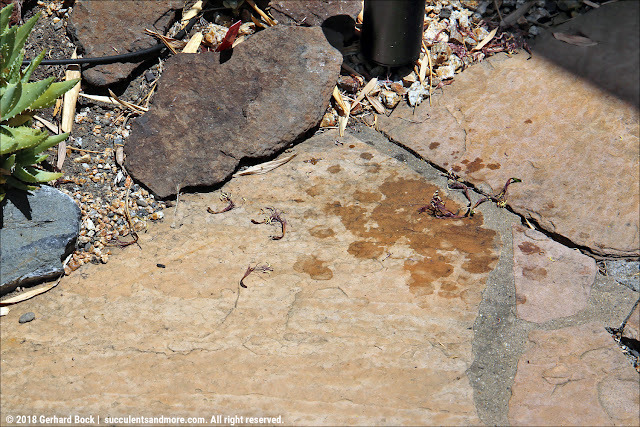 I really have a situation with my potted succulents and need a solution to get them off the ground. I am starting to visit consignment shops etc and may descend into garage sale hell if need be. 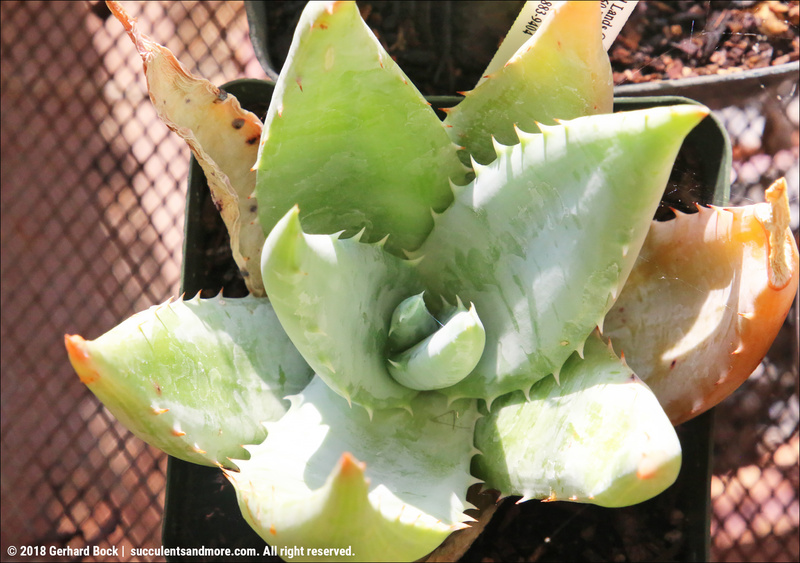 Your new Agaves are fabulous and that Aloe castilloniae is dramatic ! If you count all the tulip bulbs you've ordered, you've gotten way more plants than even me :-). Please keep us posted if you find a good solution for getting pots off the ground. I need/want to do that as well. I'm sorry, I stopped reading after "Agave 'Ripple Effect', a variegated form of 'Mr Ripple',"... Where did you get that?! Renee, 'Ripple Effect' is in tissue culture and should be on the market very, very soon. Good lord man, that’s a lot of new plants! I’m impressed with your buying skills. 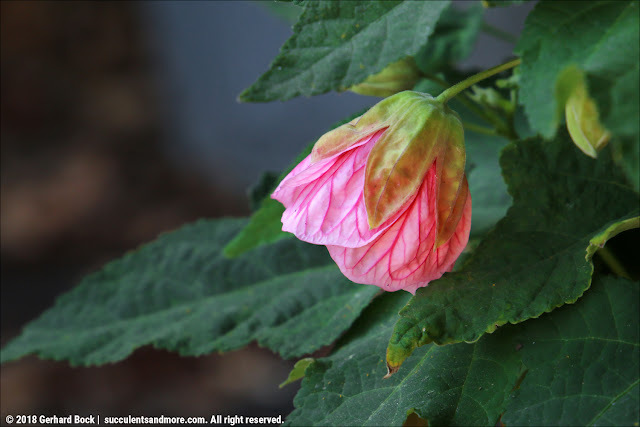 I’ve had great experience with the Abutilon 'Lucky Lantern’ series, of course I’m mainly approaching it from a cold hardy standpoint. Great to hear about your experience with the Lucky Lantern series. I have high hopes. After looking for Lucky Lantern for weeks, I've found them in two nurseries now :-). 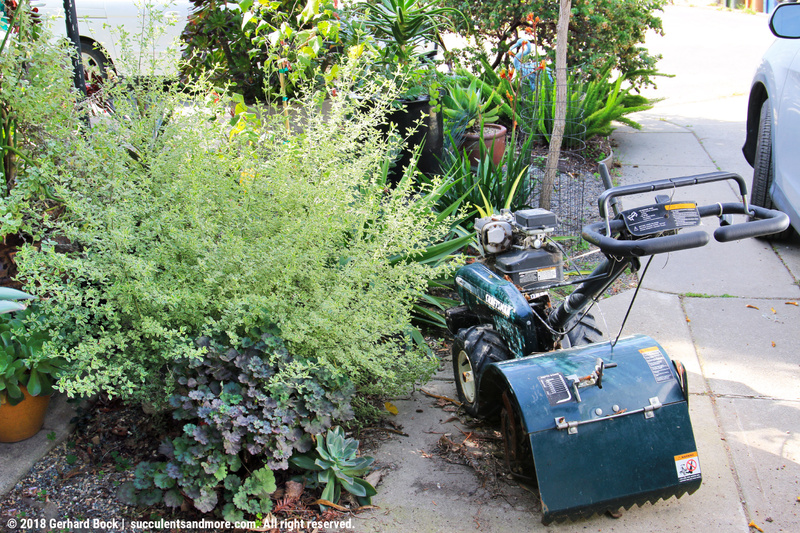 Fun to hear about what is going on in your own garden. I've always snatched plants up that really appealed to me and then worked them in some where. 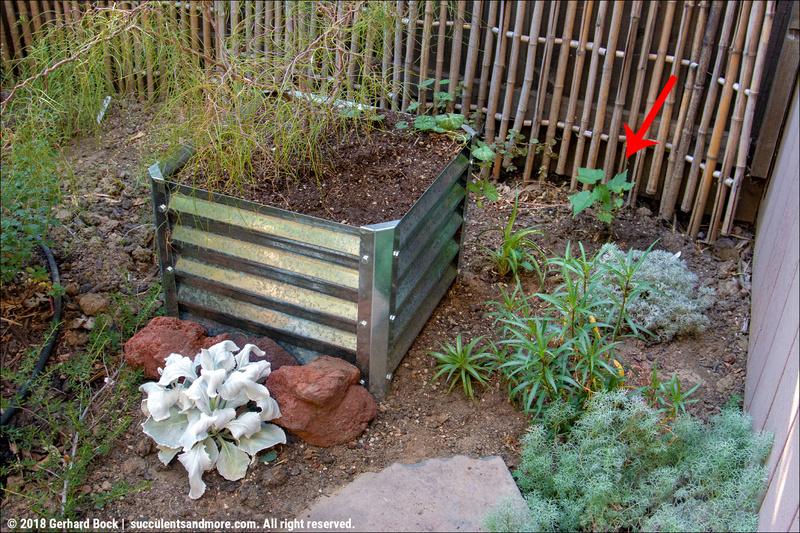 With your huge street side border you really have room for many, many vignettes. Not sure what water restrictions in your area are like but so much of what you have is xeriscape-worthy that the exception can more easily be made for the occasional thirsty guy like the abutilons. But I have a strong preference for getting plants in the ground. A potted plant is more at risk of my neglect. 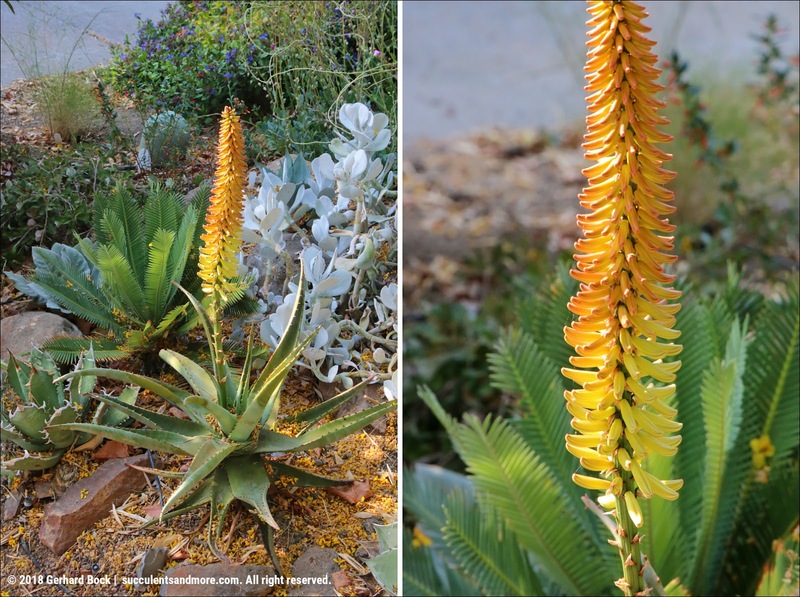 I'm sure some of these new aloes will end up in the street-side border. No discount at Poot's for mentioning my name? Darn :-). I've had good luck finding sansevierias there. It pays to carefully look at all the plants in their retail greenhouse. Thanks for the these periodic tours! I have to get some of these 'Winter' blooming Aloes! All things considered, I'm happy it turned to be Aloe africana since I didn't have one yet. There are several on the UC Davis campus and they look very happy living in Davis. I’ve recently planted two abutilon in my oak-shaded patio and am enjoying their graceful forms, in contrast to the architectural structures of the agaves, aloes, and other succulents in other areas of my garden. To deal with their water needs, I’ve buried in the ground a number of large ollas each of which holds about a week’s supply of water. Seems to be doing the trick. Ollas work great, don't they? 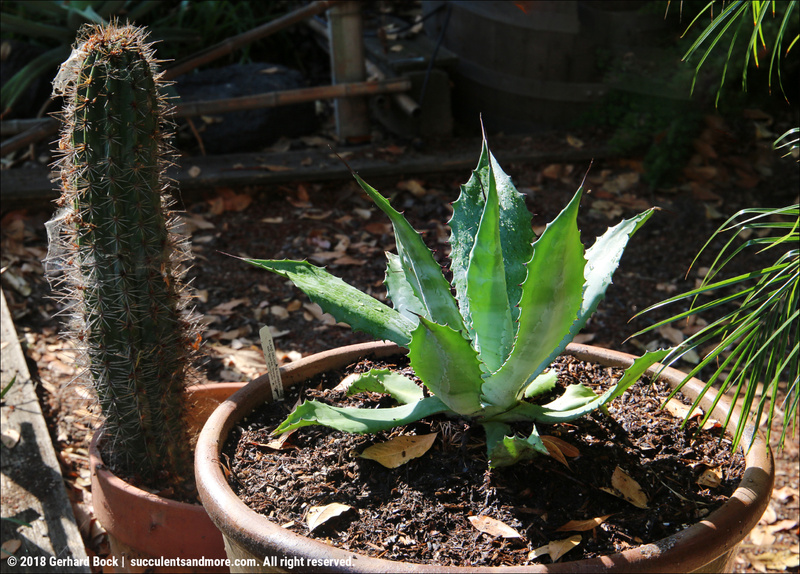 We're beginning to see more and more of them in nurseries and even big-box garden centers.